Another highlight of this optic is its 2nd focal plane Varmint Hunter illuminated reticle. The reticle offers a German #4 outline with an illuminated brilliant red crosshair featuring cross-wire hold points out to 500 yards and 20 mph winds. This reticle also offers a canting indicator that flashes when your firearm is misaligned. To help you compensate for wind drift and ballistic bullet drop, the scope has 75 MOA windage and elevation adjustment ranges with a 1/4 MOA impact point correction. Box Dimensions (LxWxH) 17.1 x 4.2 x 3.9"
3-18x50 VX-6HD CDS-ZL2 SF Riflescope (Illuminated Varmint Hunter Reticle, Matte Black) is rated 5.0 out of 5 by 1. Rated 5 out of 5 by steelwool from best hunting optic on the market Former European optic owner, until i compared mine with my hunting buddies VX-6HD. Sold the Sworo the next week and got the VX-6HD. The optical quality of this scope is amazing. The zero lock dials are repeatable. Highly recommended. Does this scope come with a sun shade? Beauman, The VX-6HD 3-18x50mm does not come with a sunshade however we do offer one that will work. The part number for the 2.5in Sunshade is 52350 and the part number for the 4in Sunshade is 52353. The Alumina Flip Back Lens Covers that are included with the VX-6HD will work with both of those sunshades. Thanks for choosing Leupold! Does the new vx-6hd, 175835, with the fine reticle have zero stop? Slack, All of the Leupold VX-6HD scopes feature our CDS-ZL2 adjustments which feature our 2 turn zero locking dials. Thanks for choosing Leupold! Is the VX6 HD available from the custom shop in first focal plane with the impact reticles? 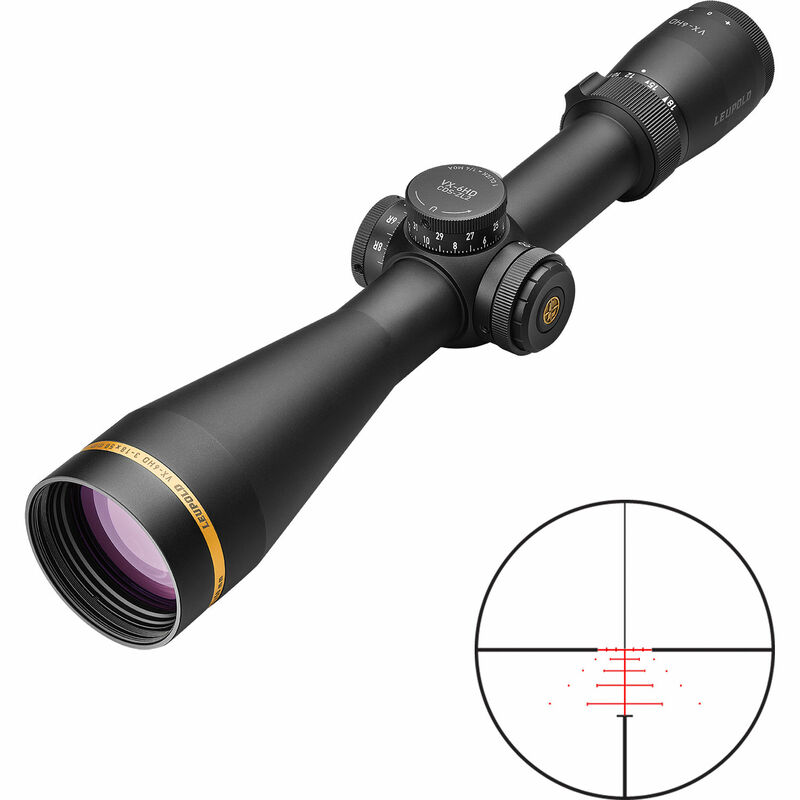 65x47, The VX-6HD series of riflescopes are only available in with the reticle in the rear focal plane. If you are looking for something in the 3-18 power range with a front focal reticle, the Mark 6 3-18x44mm would be right up your alley. Thanks for choosing Leupold! How minutes of adjustment are in one revolution of the turret? &nbsp;And is the windage adj labeled 1,2,etc or R1,R2,etc? Westbrook, The VX-6HD ZL2 dial will give you 15MOA per revolution. The windage is labeled in 1L, 2L, 1R, 2R as you indicated. Thanks for choosing Leupold! Does the VX-6HD 3x18x50mm come in mil rad for dial up? Blaserman, The VX-6HD line of scopes are currently only manufactured in MOA. Thanks for choosing Leupold! Would like to mount this scope on a Model 70 Win, would high mounts or med mounts work with the QR mount sku 50054? Anonymous, I would recommend the QR 30mm High rings, part number 49933, to mount your VX-6HD 3-18x50mm with the Winchester Model 70 QR base you specified. Thanks for choosing Leupold! Hello Scubastew, The VX-6HD series of scopes are all second focal plane scopes. Thanks for choosing Leupold! where're are the available crosshair choices for this scope? Jarhead, The VX-6HD 3-18x50mm is currently available with the following reticles: &bull;Firedot Duplex, part number 171572 &bull; Illuminated T-MOA, part number 171576 &bull;Illuminated Boone and Crockett Big Game, part number 171573 &bull;Illuminated Impact-29 MOA, 171577 &bull;Illuminated Varmint Hunter, 171575 Thanks for choosing Leupold!